Today when one thinks of bench pressing power the name of Mike MacDonald immediately comes to mind. However, if we go back a few years we come to a man who has done more for the theory of building maximum muscular bulk coupled with immense physical power than anyone else and that man's name is Mel Hennessey. Older readers (men in their thirties) will remember the middle and late sixties when record after record on the bench was broken by a man of short stature but unbelievable muscular proportions and I'm sure when it comes to thick, dense, heavy muscular development plus pleasing shape and the power to match, Mel Hennessey stands above ALL his contemporaries of the present day and his competitors of the past when it comes to physical impressiveness. To develop outstanding strength is an accomplishment in itself. To be able to stand among the world's best in any competitive strength movement is quite an accomplishment. But, to be able to mesh this strength with the muscular density of a Mr. Universe is verging on the edge of immortality and Mel Hennessey was capable of doing just that. Over the years the massive men who displayed physical roundness PLUS power have been known to us all. Serge Reding was one such man. Ivan Putski is another. Let us not forget men like Ronnie Ray, Gene Roberson, Steve Marjanian, John Molinaro, Chuck Ahrens, Chuck Fish, etc. The list is endless. Yet at the head of this list of men I place Mel Hennessey and here is his bench press specialization program. 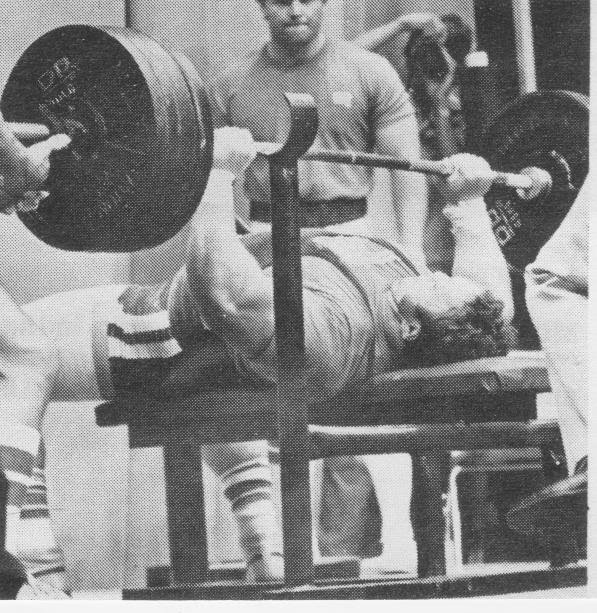 To fully understand Mel's method of training the bench press one has to review his training theories in general. First, he believes in performing all movements fluidly and strictly. There is no room for cheating or jerking movements in his routine. He also uses plenty of dumbbell movements in his training because he believes the additional stretch these movements give the muscular areas and joints will promote flexibility which will enable a more forceful contraction and explosion during the performance of a lift. Let us not forget that these shaping dumbbell movements enable a muscular condition to be built which borders on the fantastic since the poundages since the poundages he ultimately handles in these movements become quite immense. When at his peak he is capable of flat bench straight arm lateral raises with 150 lb dumbbells. And this is for sets and repetitions. All in all, this man makes sure he doesn't neglect any muscle group in his entire body so as to have no weak links. This leads to both a complete muscular development as well as all around physical strength. 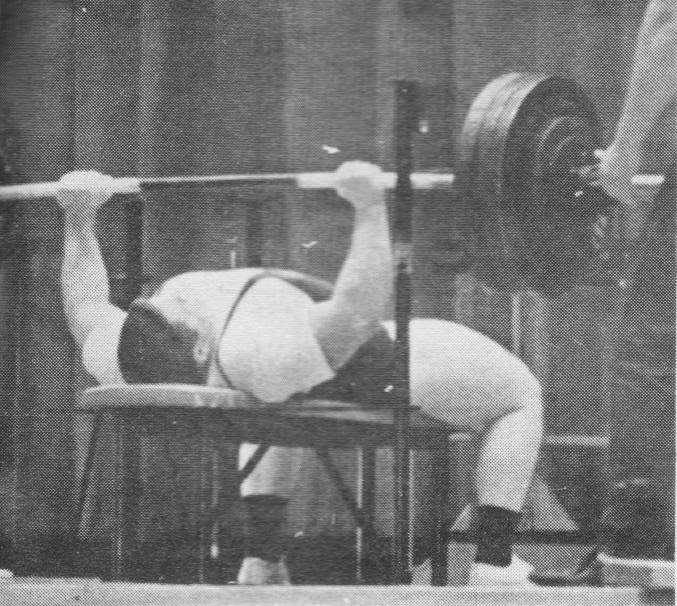 For building bench pressing power Mel Hennessey has used various movements at various times in his career to be able to yearly increase his physical performance. as we mentioned earlier, most assistance movements are performed with dumbbells for more stretch and hence more development. Heavy front dumbbell raises, side lateral raises, lying laterals, dumbbell concentration curls, dips, lying and standing triceps extensions, lat machine pressdowns and pulldowns, and dumbbell bentover rowing are the basic assistant movements he uses for bench pressing power. These movements are varied between three and six days per week, depending on how many days per week he is training. When following a six-day-a-week routine he will do the three power lifts on Monday, Wednesday and Friday, and his assistance movements on Tuesday, Thursday and Saturday. The sets vary with his energy level and how he feels the area worked is responding to the movement used. Poundages begin light and over a number of sets work up to heavy weights where from five to ten repetitions can be performed. He also cycles his training so that the nearer a contest he comes, the more assistance work is put away so that heavier attempts at benching are possible. From reviewing his training theories it seems that Mel feels that in the beginning of your cycle the assistant movements will hold back your max single on the bench because most emphasis is being placed on the dumbbell moves. However, as the contest draws nearer and the assistant work is reduced, then the past work on these movements really makes itself felt and the bench begins to ascend upward in poundage so that heavier and heavier weights are able to be handled due to an increase of the muscular mass the past work on the dumbbell movements have given him. Thus, when they are reduced in usage, the fuller muscular recuperation of the entire chest, shoulder and tricep area results in better and heavier bench pressing. When it comes to body placement on the bench, Mel believes in simply lying flat with a medium arch in the back, making the movement a pure strength feat involving the upper body muscles to a large degree with the lower body only acting as a stabilizer for steadiness. He does not, nor has he ever, gone in for the exaggerated positions some present champions use when performing bench presses in competition. To see photos of this man lifting heavy iron in a competition leaves nothing to the imagination. All three of his powerlifts were done and are done slowly, strictly and using the basic muscles of the lift with little outside assistance. It must be obvious to you by now that what he has tried to do with his training is to fully develop to a point of incredability[!] all the muscle groups used for heavy bench pressing and the results he has obtained speak for themselves. I believe his old record of 570 [?] at 242 was on the cover of one of the old 'Lifting News' magazines and in this photo you can see for yourself the flat, strict, body placement, the grip and the sheer 'slow strength' of the lift. It is Mel's contention that most young guys train too heavy too often with not enough emphasis put on the assistance movements and working up to maximum singles on the power three too frequently. Somehow they figure that the more frequently they hit their limits the faster they will gain. But they are wrong. Mel trains his way to gain slowly! The grip Mel prefers is a normal, medium grip. Too wide a grip reduces the ability to press the bar backward, reduces tricep involvement and causes shoulder injuries over time. With a medium grip (thumb length from knurling), delts, pectorals and triceps can work together to raise the most weight. He also tries to lower the bar a bit differently than most lifters. When lowered to the chest he fully tries to inflate his chest to reduce the pressing distance and to increase muscular leverage. He allows the bar to come to rest at mid-point on the pectorals not below the pectoral as most do. This also increases muscular leverage somewhat and along with this 'high bar placement' he allows the forearms to fold onto the lower bicep when in the position of bar on the chest. This allows more explosion off the chest and facilitates a more backward yet upward path of the bar. Close grip bench presses with hands four inches apart have done much to strengthen his lockout ability when doing limit bench presses. He has used over 350 for sets of between five and seven using this extremely narrow grip. He has also had much success using the standing tricep extension and concentrating on the amount of weight handled and eventually works up to over 300 for reps! Lying tricep presses also play a part in his training and in this movement he is capable of over 300 for sets and reps. If there is a secret ingredient which is responsible for Mel Hennessy's past and present success I would say that it is a combination of having the self confidence to dare to go to limits in shaping movements, along with an acceptance of hard work for many hours and a belief in himself as truly master of his soul. These are my opinions of Mel Hennessey. They will be yours too, should you ever meet him.